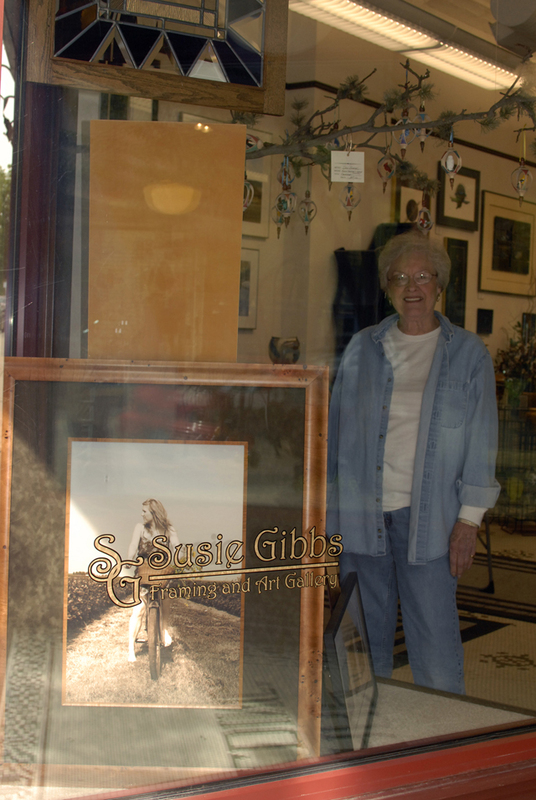 Susie Gibbs Framing and Art Gallery's specialty is custom framing. We only use state-of-the-art archival materials and framing procedures. There are over 750 moulding samples on display (ranging from ornate hand-carved gilded in 23 karat gold to contemporary natural woods). This, coupled with the finishing skills of our framers, make the selection unlimited. Susie Gibbs works in collaboration with our clients to create a uniquely framed print, painting, photograph or shadowboxed heirlooms. We also specialize in Art Restoration by working closely with Jim Altepeter to meet any of our clients needs. We also offer digital restoration of photographs. The process is done on archival paper with astounding finished products. Framed and unframed artwork on display for sale in the store. A fine arts gallery exhibiting original works in watercolor, oils, acrylic, glass, pottery, wood and limited edition prints and various other media. Susie Gibbs Framing and Art Gallery offers a unique selection of artwork by area artists. Appropriate pieces for home and office settings. Great gifts for all occasions.